Having clear intentions and being clear about what you are want in regards to your relationships, career, job, and so on in addition to asking yourself empowering questions every day helps you move forward and upward in life. It’s inevitable when you ask from a place of possibility and not from a place of being a victim because empowering questions calls forth all the power within you and you get to discover and realize how awesome you really are and can be. Asking questions and having your intentions clarified also helps you keep on track on what you want to achieve because when you ask the right questions you won’t be able to rest when you’re incongruent because you will immediately know when you go against yourself. And if you go against your better knowing you will feel restlessness and unease. You will feel when you’re on the wrong path and that way you will always be able to steer away from that which is not life-affirming and life-enhancing. Your intuition, and conscience, will let you know when you’re off path. (1) You will experience unpleasant things in regards to those friendships that tells you clearly that you should remove yourself from them; you will be reminded of why you should leave them, and if you don’t follow that inner guidance something will happen that pushes you to leave. But it doesn’t have to become dramatic if you listen the first time. Having to come to a dramatic breaking-point is unnecessary if you just listen when your intuition or conscience speaks to you. (2) Or it might keep you awake all night where you toss and turn in bed, unable to let the nagging feeling inside you go, or it might wake you up early and demand that you take the bull by the horn and end the relationship before any dramatic situations occur. And if you don’t listen then the negative aspects of the relationship will only escalate and the risk of drama gets higher and higher. When you do follow through it might feel uncomfortable at first because you move outside of your comfort zone, but very soon after you have made a clear decision and acted upon it you will feel a wonderful sense of freedom and empowerment. 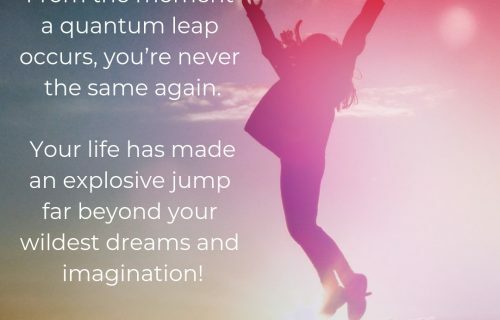 You will feel lifted up to an even higher level of consciousness. Elevated. We have to let go of the lower to raise in consciousness. We can’t remain in the same energy and expect (to) change. This is so beautiful because it includes everything; you can trust it 100% in all areas of your life. You intuition (and conscience) will wake you up in the middle of the night if there is something important going on in your life that you need to be aware of, it will always warn you and instruct you if something is urgent and needs your attention. This is why stating your intentions are crucial. You need to be clear on what you want and where you’re going, and it can be generally speaking too, I’m not necessarily speaking about having a ten year plan scripted and planned before you. But even generally just stating what you accept and want in life is enough to propel you in a much clearer direction in your life, and then asking yourself questions every day that helps you move in that direction, a much more empowered direction. It can be that you want a job, a loving and respectful relationship, or become financially independent, or healthy, or something general like that. Once you are clear about it you will be directed to take the right, necessary steps and actions to fulfill those desires even if the desires are not crystal clear and detailed. So if you intend to become healthy, you’re conscience will let you know when you’re slacking off when you should be at the gym. It will kick you out of bed and compel you to do what you have intended to do. Our conscience always arrest us and confronts us and that’s a wonderful thing! And the questions we ask ourselves too can confront us and our beliefs because they require us to grow and move forward. If you’re stuck financially for example, or if you feel sluggish and unfulfilled in any area of your life, questions will get you unstuck. And of course the willingness to ask them and then listen for the answers and act accordingly by taking the actions that your guided to take. It’s all about shifting you perspective and move from a lower state of consciousness to a higher state and in doing so there’s no gap between your words and your deeds because you’re spiritually congruent. So instead of asking dis-empowering questions-like “why is this happening to me”, or “why can’t I get a job?”, ask yourself questions like the ones I share in the audio below. Questions that you actually want the answers to. The right questions prompts creativity and inspiration so it’s great to kind of provoke yourself with these kinds of questions because it opens up for you to access information that you weren’t aware of before. The questions I share places you in action, they stir up activity within your own mind and being, they open up for gratitude and makes you available for more in life as you will be able to see hidden gifts that you weren’t able to see before. You simply ask yourself the questions without seeking the answers, but you let them emerge from within. You become still and attentive to what wants to come forth and be shown to you. If you knew the answers consciously you wouldn’t have to ask them in the first place, so let them come from a deeper place from within you. Open up to brand new information and wisdom that you didn’t have before, and that will create a great platform from which to move forward in your intentions and desires. Remember that everything was once impossible and seemingly hidden. Just look around in the room where you are right now; everything in that room was once impossible, but somehow they were created anyway simply because someone believed there was a way, so the way appeared. They asked the right questions that gave them access to creativity, inspiration and innovativeness, and newness. 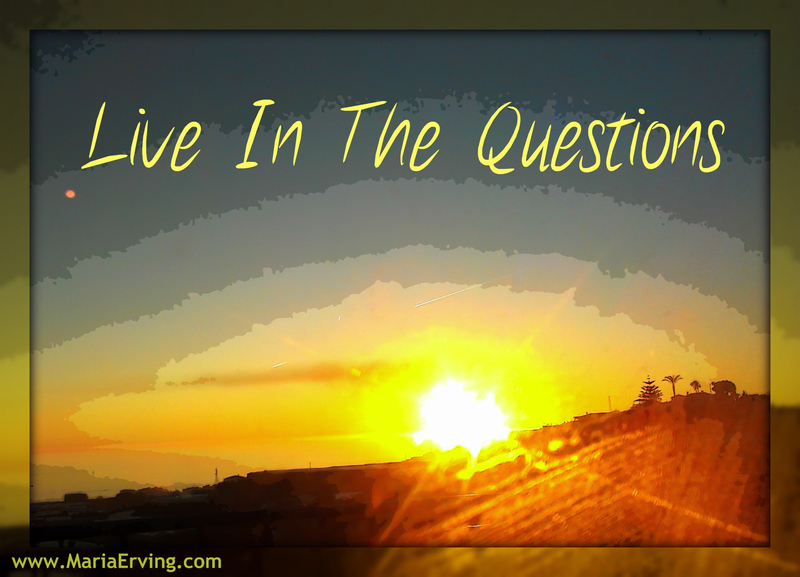 Questions allows your mind to seek the greatest possibilities for you and the world you want to live in and the answers you receive is a powerful energy that propels you forward towards fulfillment and freedom. They make you to consciously choose to live more, to do more, to enjoy more, and to be greater than any circumstance or situation you find yourself in. You deserve the very best that life has to offer! 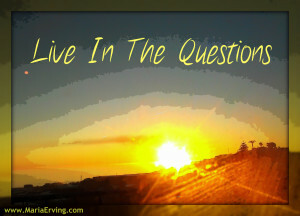 We all do, and by asking the right questions we’re always lead to what we consider to be a fulfilling life. To access the audio recording with the empowering questions you need to be a member of mariaerving.com, and if you’re already a member simply log in and it will be visible for you here on this page. 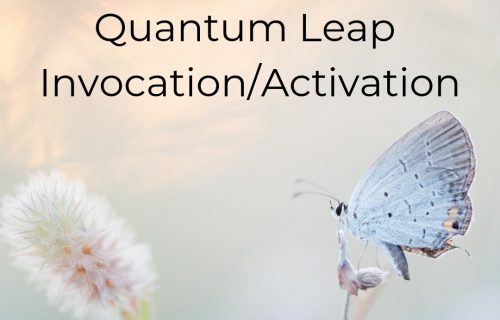 I invite you to listen to the questions as I speak them and then repeat them to yourself and really feel how the drop into your subconscious mind where they will germinate and become activated. Do not try to figure out the answers with your conscious mind but have an attentive, curious attitude as you hear them and speak them to yourself and let them sink into your deeper mind where they will become alive. For best result and effect, listen twice; first by repeating the questions to yourself and then one more time where you simply listen to them and let them sink in even deeper into your subconscious mind as your brainwaves are even slower when you’re not using your awareness as much as you are when you participate by repeating the words. These questions will awaken something new and undiscovered within you, so pay attention to what comes to you in the next few days and also notice how you begin to change inwardly and how that affects your life at large. You could even write down some of the questions that resonates most and read them out loud throughout the days that follow to remind yourself where you want your attention to flow. As you live with the questions they will pop up in your mind now and then and you will begin perceiving and seeing life in a different way as well as doing things that are more enjoyable and constructive. Get coached by me: CLICK HERE!